A portrait of Beverly Gray now hangs in the entrance of the Beverly Gray Business Exchange Center, based on a photograph of her standing in front of Buffalo's City Hall. Her head is held high, and she is looking upward into the distance. Fittingly, the artwork was created by an entrepreneur, the kind of person who can benefit from the building's mission. "She represents the small businesses, and myself I’m an entrepreneur," said Buffalo artist Edreys Wajed. "She’s looking forward, she’s bright, optimistic, it captures all of those things," Wejed said. "That was my job, to capture that look in her eyes, all the little details ... her mouth is not closed, it’s partly open, as if she’s about to say something." Gray, an East Side activist who served in the Buffalo Common Council, died in 2004. 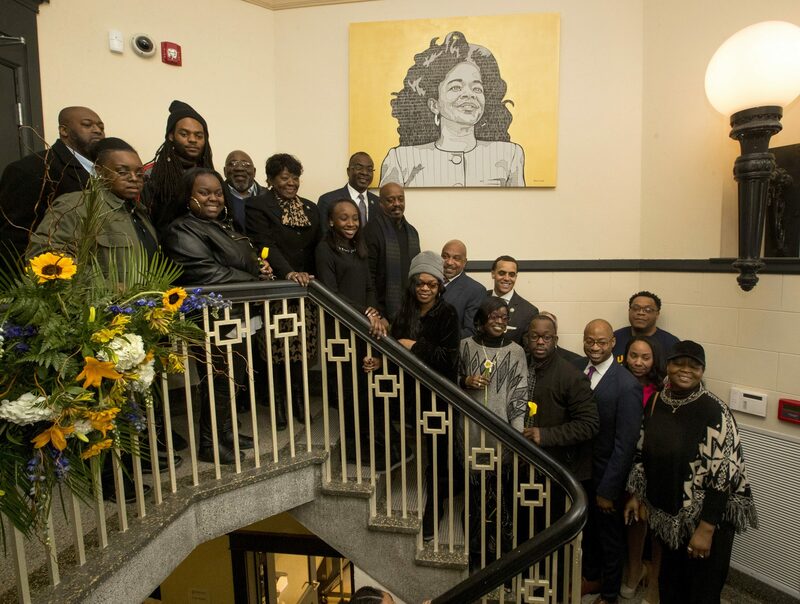 Wajed's portrait of her was unveiled at the business center at 344 East Utica St. Gray saw Jefferson Avenue's potential as an economic corridor, and that is what local leaders hope the Beverly Gray Business Exchange Center will be able to foster. "Beverly Gray was a dedicated community advocate, city council member and an entrepreneur who envisioned Jefferson Avenue and Buffalo's East Side as a vibrant hub for innovation and economic growth," said Buffalo Mayor Byron W. Brown. "The center is a wonderful addition to this neighborhood, creating opportunity for minorities, women and veterans. ... Ms. Gray would be proud." The government-funded center, operating in the former Utica Street Library, opened in the fall of 2018 and services entrepreneurs and small business people. "It's a great responsibility to maintain the legacy of who Beverly Gray was," said Royce Woods, the center's executive director. He then directed his remarks to a large contingent of Gray's family members on hand for the ceremony. "My staff and I are going to come to work every day and bust our tail, to make sure that what happens out of this building is (something) that you all will be proud of and that she would be proud of," Woods said. Damion Anderson, who owns Sha's World, a T-shirt store and The Foundry at 298 Northampton Street, said the center helped him secure a loan that enabled him to expand his growing business. "I can service everybody now," Anderson said. "And it all happened in a matter of months. To the family of Beverly Gray: I didn't know the profound impact that she had on the community, but I will let you know that I will be a success story in the name of Beverly Gray." Nina Hardy, owner of Divinity Holistics & Beauty, a spa located at 528 Elmwood Avenue, said she received support for a pitch competition in November and that the center has assisted her with a business plan. "Today we are here because the name Gray is great," said Rev. Darius Pridgen, the Common Council president. "The same way she opened up so many doors for women, for African-Americans, for minority business, is the same way this center will open up the doors. Say what you want about the East Side, but the East Side is back. The East Side is strong."